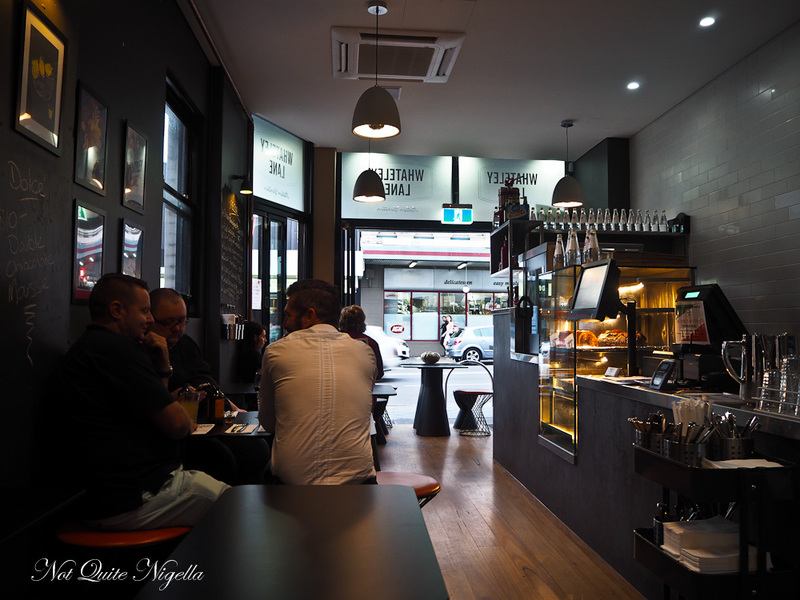 A cheap and cheerful Italian canteen on Newtown's busy King Street, Whateley Lane is popular as a pre or post movie pasta dinner. 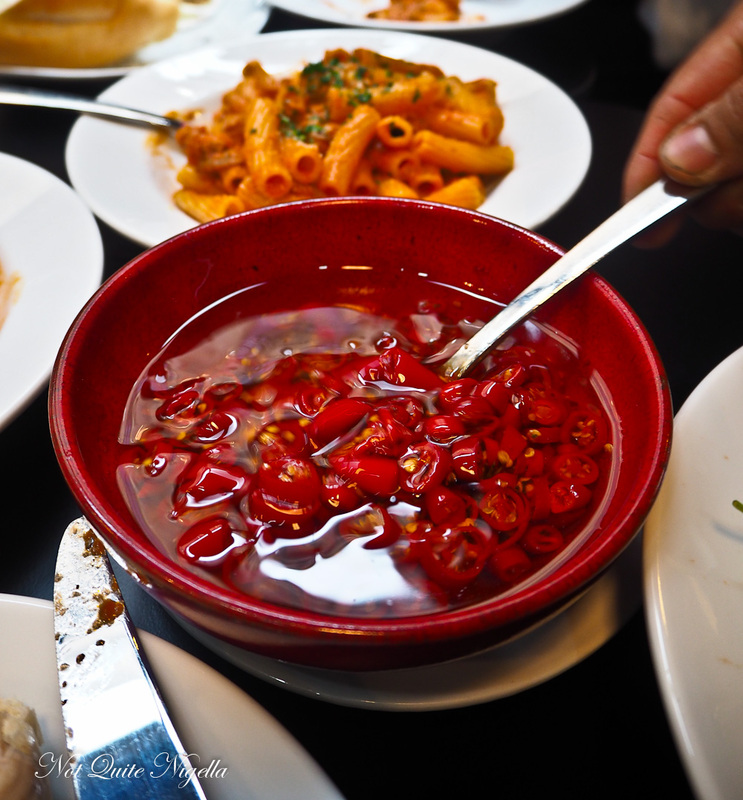 Owned by brother Ciccio and Sal La Rosa of Gelatomassi a few doors down, it serves Sicilian style Italian pasta dishes - with their chilli oil if you like it spicy. A thought occurred to me the other day. I seem to spend a lot of time in the Inner West of Sydney. This is for various reasons but mainly because my friends Belinda and Nick live there but there are also so many great new places opening up there. We tend to visit Newtown often because there is no shortage of places to eat but also because we like the cinema there too. It was a Monday night, a night that I usually spend at home recovering from the weekend. I am meeting Belinda and Cheryl on King Street in Newtown for a quick dinner before a movie. 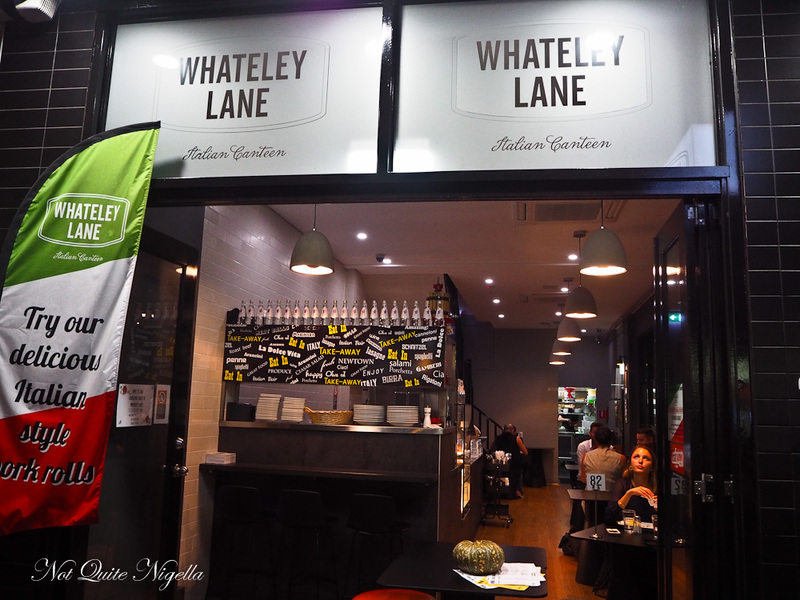 Whateley Lane is owned by brothers Ciccio and Sal La Rosa from Gelatomassi a few doors down (disclosure: they are good friends with Belinda and Nick). Their concept is a simple, no fuss Southern Italian canteen designed to feed people before or after movies. Prices are kept low with pasta plates averaging $15. The menu is all on one sheet and we pick a few favourites, designed to share. 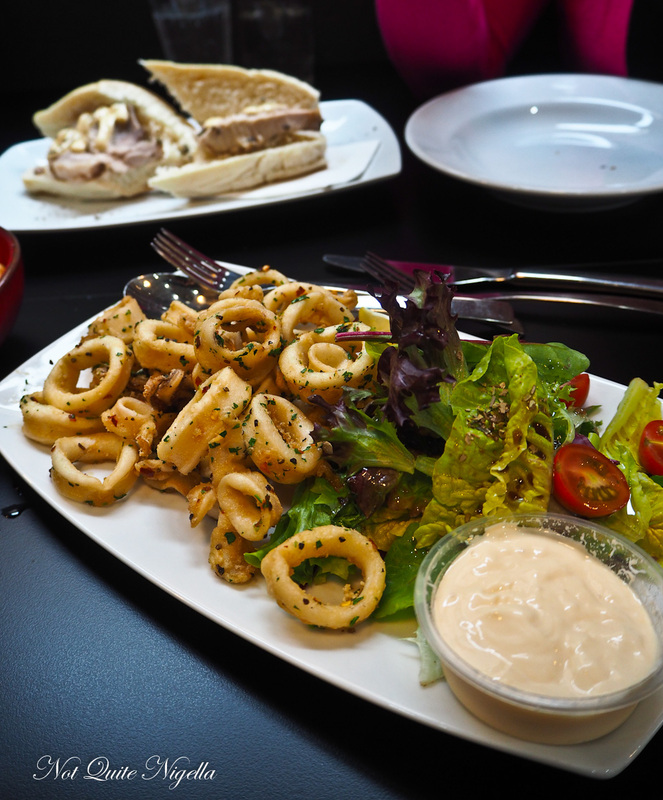 While the calamari is tender, it's very lightly dusted with flour and could use a little more to give it crispiness. The aioli could also use more garlic in it although it is a generous serve. 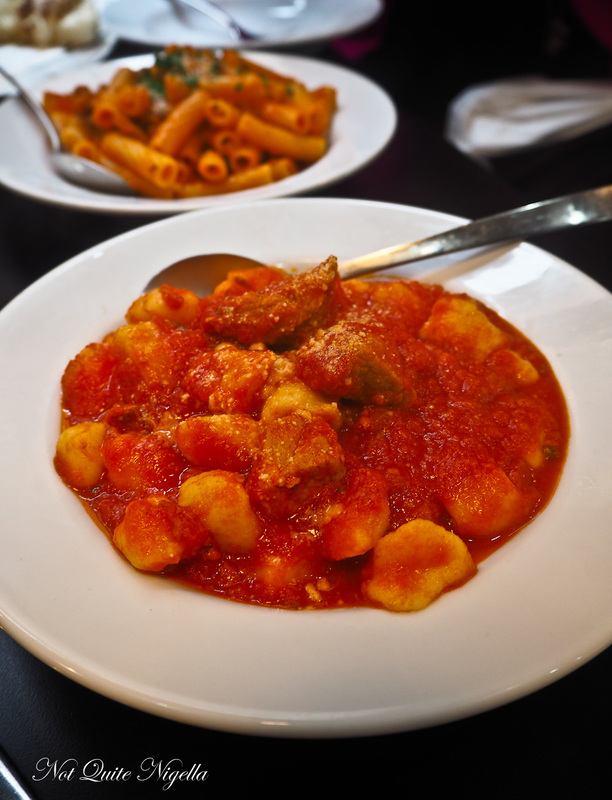 I must admit that I loved the sound of the gnocchi pork rib ragu with small chunks of pork rib meat that were soft and tender. It's good and comes as a generous serve. Even between Belinda, Cheryl and I, we can't finish it but Cheryl eagerly takes it home for her husband. Roughly once a week Belinda goes to the movies in Newtown and invariably, she eats here (it's literally across the road from the cinemas) and she always orders this pasta. It's rigatoni pasta with crumbled Italian pork and fennel sausage mince, mushrooms, onions and parmesan in a creamy tomato based sauce. 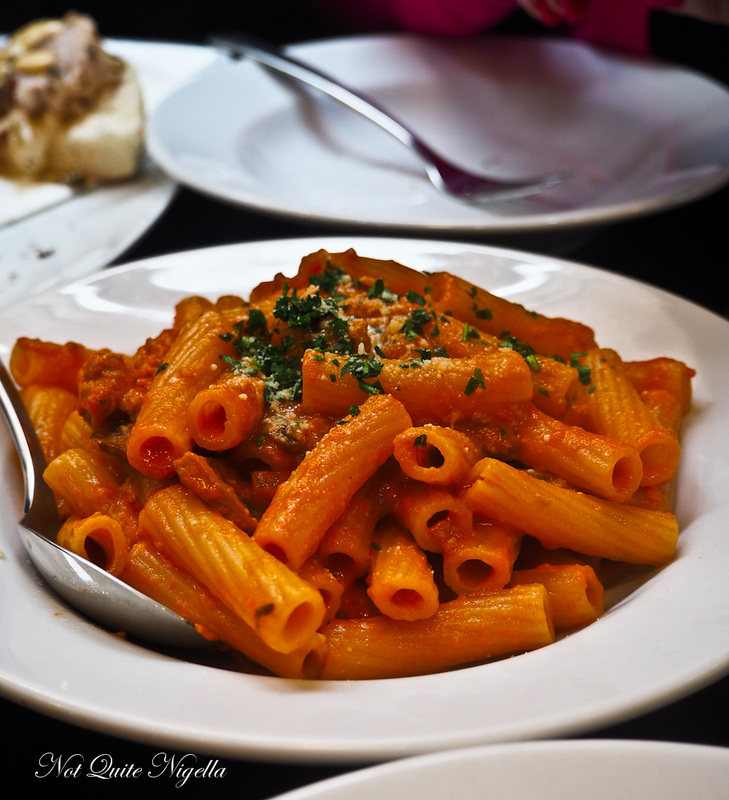 The pasta has a good texture and it's flavoursome, each piece of rigatoni coated with sauce with just the right amount of sausage. It's my pick of the pasta courses too. 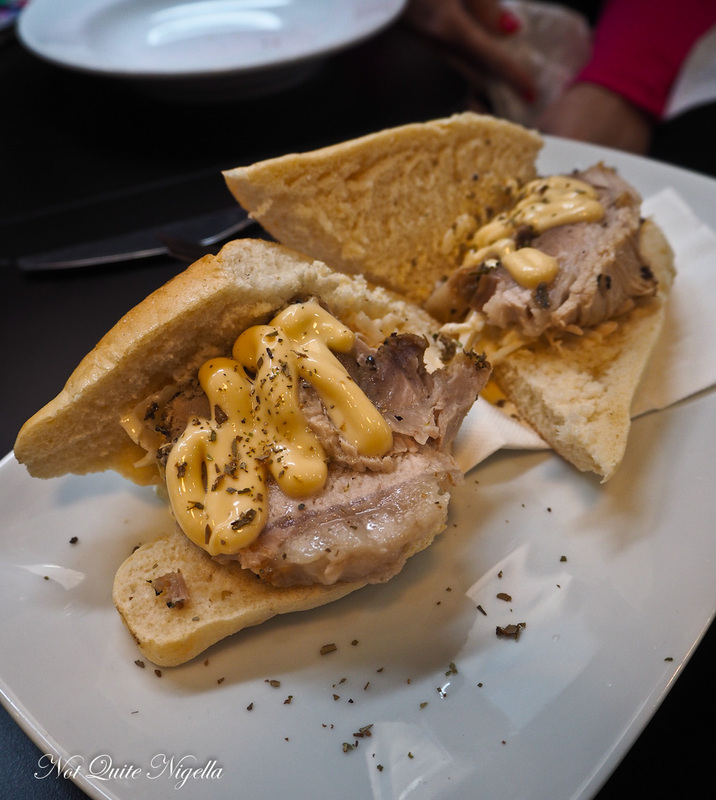 The roast pork or porchetta is very popular here and they sell it as a roast plate, in a takeaway box by itself or in a soft Italian roll. The porchetta is perfectly seasoned, juicy and tender and here it is served with coleslaw and aioli (although a bit more garlic in the aioli would have been great). 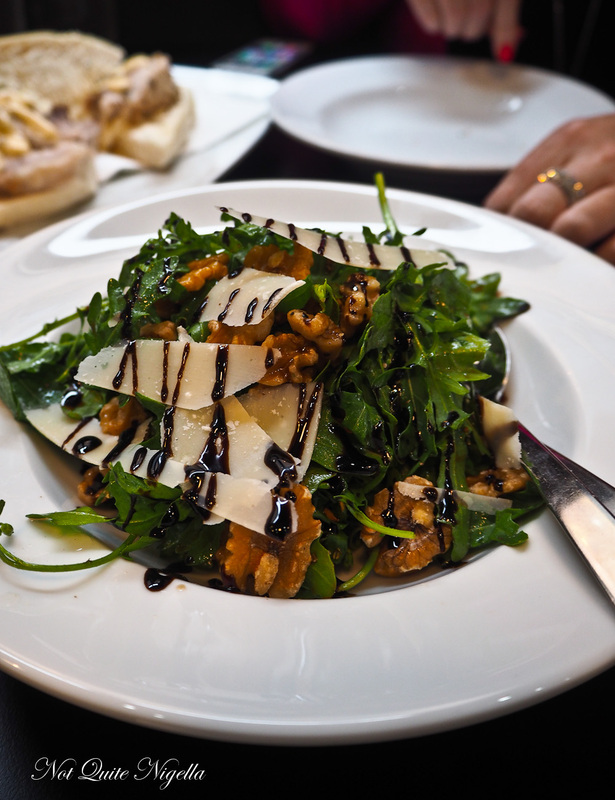 For a side we order the rocket salad, a simple but good salad with plenty of peppery rocket, walnuts, parmesan cheese drizzled with an olive oil and lemon vinaigrette dressing. There are a couple of dessert options here: chocolate mousse and cannoli. 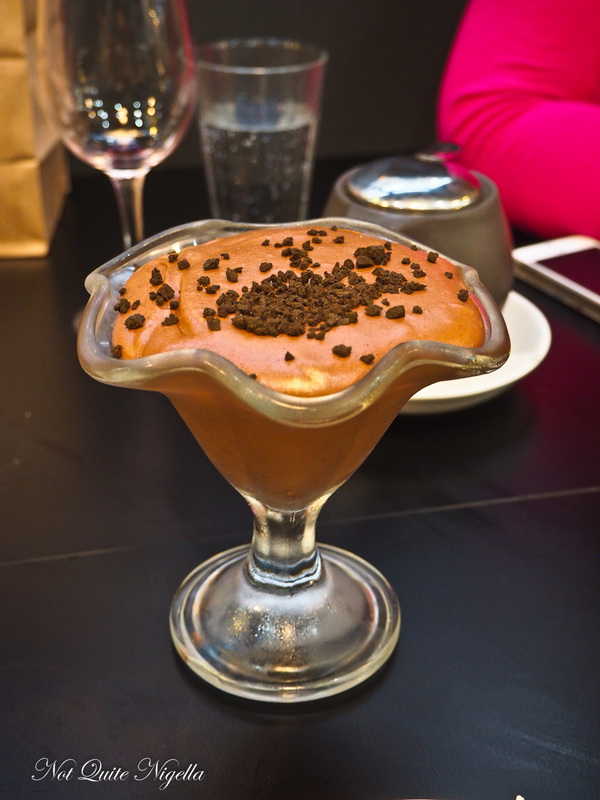 We have to try both and the smooth and rich mousse is made by Ciccia's brother Salvatore who was a pastry chef. But I know that I have to leave room for the cannoli, all crunchy shell outer filled with a smooth ricotta filling with just a hint of cinnamon. 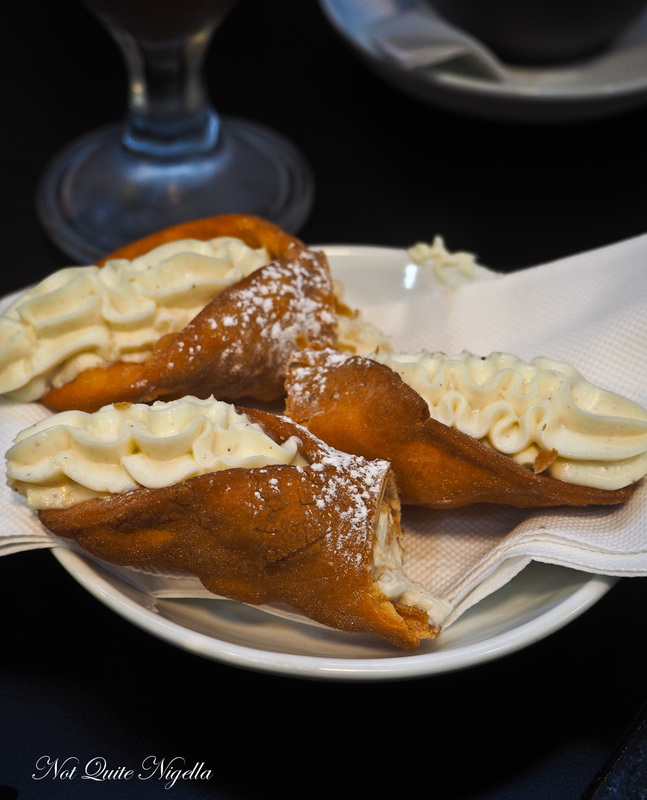 They also do an ice cream filled cannoli at Gelatomassi. As Ciccio is good friends (or as we say like a brother) to Nick and also knows Belinda, he brings us some gelato from their store a few doors down. There is a mango and coconut, smooth texture and rich with coconut and a hint of mango. The blood orange is refreshing and tastes almost Fanta-like. 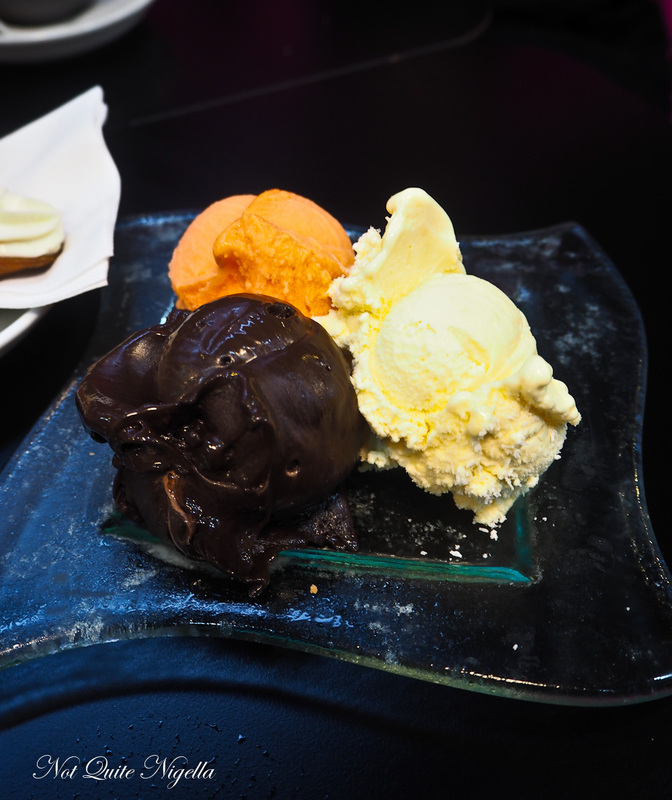 But it's the 84% Valrhona chocolate gelato that has all of us swooning. It's absolutely dark with just the right amount of sweetness but still has a somewhat unexpected creaminess. So tell me Dear Reader, do you go out to eat before or after a movie? And what was the last good movie that you watched?